Timothy Leroy Lincecum (/ˈlɪnsᵻkʌm/ LIN-sə-kʌm; born June 15, 1984), nicknamed "The Freak", is an American professional baseball starting pitcher who is a free agent. He pitched in Major League Baseball (MLB) for the San Francisco Giants from 2007 to 2015 and for the Los Angeles Angels of Anaheim in 2016. Lincecum helped the Giants win three World Series championships in a five-year span. Lincecum was the team's ace starter in 2010 and as a relief pitcher in 2012 and 2014, winning the Babe Ruth Award in 2010 as the most valuable player of the MLB postseason. After attending Liberty Senior High School in Renton, Washington, Lincecum played college baseball at the University of Washington. Pitching for the Washington Huskies, he won the 2006 Golden Spikes Award. That year, Lincecum became the first Washington Husky to be selected in the first round of an MLB Draft, when the San Francisco Giants selected him tenth overall. Nicknamed "The Freak" for his ability to generate powerful pitches from his athletic but slight physique and "Big-Time Timmy Jim" for his clutch pitching, the 5'11" 170 pound power pitcher led the National League in strikeouts and strikeouts per nine innings pitched for three consecutive years in a span from 2008 to 2010 as well as shutouts in 2009, helping Lincecum win consecutive Cy Young Awards in 2008 and 2009 to become the first MLB pitcher to win the award in his first two full seasons. He has also appeared in four consecutive All-Star Games, from 2008 through 2011. In 2013, Lincecum pitched the first Petco Park no-hitter against the San Diego Padres. He repeated the feat again the following year, also against the Padres, becoming the first pitcher in MLB history to secure the first no-hit repeat against the same team in consecutive seasons. Lincecum is one of only two pitchers in MLB history to win multiple World Series championships, multiple Cy Young Awards, throw multiple no-hitters, and be elected to multiple All-Star Games, the other being Hall of Famer Sandy Koufax. After high school Lincecum went on to pitch for the University of Washington. In 2006 he finished with a 12–4 win-loss record and a 1.94 earned run average (ERA), 199 strikeouts, and three saves in 125⅓ innings  as a Washington Husky. He won the 2006 Golden Spikes Award, which is awarded annually to the best amateur baseball player. In the summer of 2004 Lincecum played for the amateur National Baseball Congress (NBC) Seattle Studs and won two games in the NBC World Series. In 2009 he was named NBC Graduate of the Year. In the summer of 2005, he played for the Harwich Mariners in the Cape Cod Baseball League. During his brief minor league career he was frequently named as the top pitching prospect in the Giants organization. Lincecum made his professional debut on July 26, 2006, with the Salem-Keizer Volcanoes (the Giants' Class A Short Season affiliate) against the Vancouver Canadians, pitching one inning and striking out all three batters he faced. After his second outing on July 31 against the Boise Hawks, in which he pitched three innings, striking out seven and allowing just one baserunner, he was promoted to the High Class-A San Jose Giants. On August 5, in his first start in San Jose against the Bakersfield Blaze, he pitched 2⅔ innings, allowing three runs (two earned), and striking out five. Lincecum finished the year 2–0 with a 1.95 ERA, 48 strikeouts, and 12 walks in 27⅔ innings pitched. He also got the victory in the opening game of the California League playoffs, giving up one run on five hits in seven innings, striking out ten and walking one against the Visalia Oaks. Visalia would win the series 3–2. Going into 2007 Lincecum was ranked as the #1 prospect in baseball and the #1 prospect in the San Francisco Giants by Baseball America. He spent the first month of the season pitching for the Fresno Grizzlies, the Giants' Triple-A affiliate. In five starts (31 innings), he allowed just one run, twelve hits, eleven walks, while striking out forty-six and going 4–0. During his 2006 and 2007 minor league campaigns, Lincecum struck out the highest percentage of batters (minimum 100) of any minor league pitcher in the last ten years: 30.9 percent. In the spring of 2007 Colorado Rockies prospect Ian Stewart called Lincecum "the toughest pitcher [he] ever faced", adding "Guys on our club who have been in the big leagues said he's the toughest guy they ever faced too … I’m not really sure why he's down here, but for a guy who was drafted last year … that guy is filthy." With an injury to the Giants' fifth starter, Russ Ortiz, Lincecum was called up from Fresno to make his first major league start on May 6, 2007, against the Philadelphia Phillies. In his first career inning, Lincecum struck out three, the first being Chase Utley. He earned his first major league win in his next start, on the road against the Rockies. Lincecum, who is often compared to retired pitcher Roy Oswalt, faced him in each of his next two starts against the Astros. After the first match-up, Astros third baseman Mike Lamb said, "The stuff he was throwing out there tonight was everything he's hyped up to be. He was 97 mph (156 km/h) with movement. You just don't see that every day. He pitched very much like the pitcher he is compared to and out-dueled him throughout the night." The pair dueled to a no-decision the first time, and Lincecum pitched eight innings and got the win the second time. In July, he went 4–0 with a 1.62 ERA. On July 1, in a seven inning performance against the Arizona Diamondbacks, he struck out twelve, the fourth highest total ever by a Giants rookie. Lincecum pitched into the ninth inning for the first time on August 21 against the Chicago Cubs, holding a 1–0 lead. He had allowed just two hits and one walk through the first eight, while throwing only eighty-eight pitches. Cubs shortstop Ryan Theriot said after the game, "He's got electric stuff. The best stuff I've seen all year." Lincecum was shut down in September as a precaution, due to his high inning count in his first full year of professional ball. Between the minors and the majors, he pitched a total of 177⅓ innings. The Giants asked Lincecum not to throw the bullpen sessions typical of other pitchers during the off-season. Manager Bruce Bochy told the San Francisco Chronicle that they were being careful with Lincecum because studies have shown that pitchers who throw 200 innings early in their career are more susceptible to injuries. On May 15, after Lincecum struck out ten Houston Astros in six innings, Houston first baseman Lance Berkman offered his view of Lincecum: "He's got as good of stuff as I've ever seen. ... He's got three almost unhittable pitches." After falling to Lincecum and the Giants 6–3 on May 27, Arizona Diamondbacks first baseman Conor Jackson gave his impression of facing Lincecum: "He's got good stuff", Jackson said. "From what I saw tonight, that's the best arm I've seen all year, no doubt. You've got to almost hit a ball right down the middle. You're going to pop up the ball at your bellybutton, which we all did tonight, and the one down, it's coming in at 98 mph (158 km/h), you're not going to put too much good wood on it. Even the ones down the middle are coming at 98. He's good, man." Lincecum was on the cover of the July 7, 2008, issue of Sports Illustrated, and on July 6, he was selected to play in his first Major League Baseball All-Star Game. However, he was hospitalized the day of the game due to flu-like symptoms and was unavailable to pitch. In a July 26 game against the Arizona Diamondbacks, he struck out thirteen batters in seven innings while allowing seven hits, two earned runs, and no walks. Lincecum pitched his first shutout, against the San Diego Padres on September 13. In nine innings he threw 138 pitches, gave up four hits and struck out twelve batters. On September 23, he broke Jason Schmidt's San Francisco single-season strikeout record with his 252nd strikeout of the season against the Colorado Rockies. He finished the season with 265 strikeouts (54 of them three-pitch strikeouts, the most in the majors), making him the first San Francisco pitcher to win the National League strikeout title, and the first Giant since Bill Voiselle in 1944. His 10.5 strikeouts per nine innings pitched were the best in the majors, and his .316 slugging-percentage-against was the lowest in the major leagues, as was his .612 OPS-against. His 138 pitches on September 13 were the most by any pitcher in a game in 2008. He finished the season with an 18–5 record. On November 11, 2008, Lincecum was awarded the NL Cy Young Award, making him the second Giant to win the award, after Mike McCormick. He finished 23rd in the National League Most Valuable Player Award voting by the Baseball Writers' Association of America. After winning the NL Cy Young Award in 2008 Lincecum continued his dominance in the National League. On June 2 at Nationals Park, Lincecum struck out the Washington Nationals' Christian Guzman for his 500th career strikeout, becoming the fastest Giants pitcher in franchise history to reach the milestone. In his six June starts he went 4–1 with a 1.38 ERA, and pitched three complete games. On July 3, Lincecum was announced as the NL Pitcher of the Month for June. Lincecum was announced as an NL All-Star along with his teammate Matt Cain. He was also the starting pitcher for the NL. Lincecum went two innings in the All-Star Game, giving up two runs, one earned, and striking out one. Through twenty starts in 2009 Lincecum had amassed an 11–3 record with a 2.30 ERA, 183 strikeouts, four complete games, and two shutouts. Lincecum also had a twenty-nine scoreless inning streak, third-best since the Giants moved west in 1958. On July 27, in a 4–2 win over the Pittsburgh Pirates at AT&T Park, Lincecum pitched a complete game and struck out a career-high fifteen batters, the second most in San Francisco Giants franchise history. His fifteen strikeouts is the most recent occurrence since Jason Schmidt fanned sixteen on June 6, 2006, who reset the San Francisco record surpassing Gaylord Perry and also tied Christy Mathewson's all-time franchise record. On August 3, Lincecum was named National League Player of the Week. Lincecum missed his first game since coming up to the big leagues on September 8 against the San Diego Padres. Madison Bumgarner took his place that day, making his major league debut. Lincecum was healthy enough to make his next start on September 14, pitching seven innings with eleven strikeouts lowering his ERA to 2.30, and picking up his fourteenth win of the year. Lincecum finished the 2009 season with a 15–7 record, 2.48 ERA and 261 strikeouts. Following the season, Lincecum was named Sporting News NL Pitcher of the Year for the second consecutive year. He was later cited during a traffic stop on October 30 for misdemeanor possession of marijuana. On November 19, Lincecum was awarded his second consecutive Cy Young Award, narrowly edging out St. Louis Cardinals pitchers Chris Carpenter and Adam Wainwright, who actually had the most first place votes. In doing so, he became the first pitcher in Major League Baseball history to be awarded the Cy Young in each of his first two full seasons. He finished 18th in the National League Most Valuable Player Award voting by the Baseball Writers' Association of America. Lincecum continued his dominance in the Majors by starting 5–0. His strikeouts piled up quickly and was atop the Major Leagues in the category through the early season. However, issues concerning Lincecum's control over the movement of his pitches arose when he walked five batters for the fourth consecutive start on May 31. Although the early struggles have been mostly dismissed as a "lack of confidence" or "mental" issues, Lincecum himself admits that the slump lasted "longer than I was hoping it would." Lincecum eventually recovered somewhat from his slump and made the 2010 National League All-Star Team. As of the All-Star break, Lincecum was 9–4 with a 3.16 ERA over 116.2 innings pitched. One of his great first half accomplishments was that Lincecum defeated Houston's Roy Oswalt three times in three months. All three games were pitchers' duels. On July 15, 2010, in his first start after the All-Star game, Lincecum pitched a six-hit, complete game shutout against the New York Mets. After a disappointing August, Lincecum came out of his slump on September 1; pitching against one of the league's top pitchers, Ubaldo Jiménez, Lincecum pitched 8 strong innings of 1 run ball. This was Lincecum's first win since July 30. Lincecum continued to improve throughout September, finishing 5–1 with 52 strikeouts and 6 walks as compared to the 20/13 ratio in August. Lincecum managed to win his third consecutive National League strikeout title, he also set a record for most strikeouts by a MLB pitcher in his first four seasons. Lincecum finished the 2010 regular season with a 16–10 record, 3.43 ERA and 231 strikeouts. On October 7, in his first postseason game, Lincecum pitched a complete game two-hit shutout, striking out a playoff career-high 14 batters, against the Atlanta Braves in game 1 of the NLDS, breaking the all-time record for strikeouts in Giants postseason history. In his next postseason start, he outdueled Roy Halladay by pitching 7 innings and giving up 3 earned runs, while striking out 8 in the Giants' 4–3 victory over the Phillies in Game 1 of the National League Championship Series. 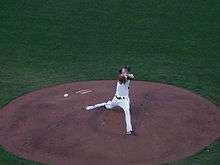 In Game 6 on October 23, with the Giants clinging to a one run lead, Lincecum was summoned from the bullpen on one day's rest to pitch the bottom of the 8th. He struck out the dangerous Jayson Werth before surrendering singles to the next two batters. The Giants won the game 3–2, advancing to the 2010 World Series. Lincecum pitched in both Games 1 and 5 of the World Series, earning a win in both. Game 1 of the 2010 World Series saw Lincecum contribute to an 11–7 win over the Texas Rangers. After presenting a strong start, he sat out the final 3 1/3 innings as the San Francisco bullpen preserved a comfortable win. On November 1, 2010, Lincecum started Game 5 of the World Series with an opportunity to clinch a world championship for San Francisco. Lincecum utilized all his pitches in throwing 8 solid innings, collecting 10 strikeouts while giving up only 3 hits, including a home-run, en route to a 3–1 victory. His victory in Game 5 ended the Giants' 56-year drought between championships and also gave San Francisco its first baseball world championship in history. Lincecum also set franchise single postseason records with four wins and forty-three strikeouts by a right-handed pitcher. On May 4, he struck out twelve Mets becoming the Giants franchise record holder for the number of games pitched with 10 or more strikeouts with 29, surpassing Hall of Fame "first five" inaugural member Christy Mathewson. Mathewson accumulated his 28 ten-plus-strikeout games in 551 starts over seventeen seasons of pitching for the Giants; Lincecum collected his 29 in 129 starts over five seasons. On May 21, he threw his 8th career complete game and his 5th career shutout against the Oakland Athletics. Lincecum almost threw his first no-hitter on April 18, giving up his first hit after 6 1/3 innings. On June 6, he recorded his 1,000th career strikeout against the Washington Nationals, striking out Jerry Hairston, Jr.. He accomplished this during his fifth year in the Major Leagues, becoming only the eighth pitcher in history to do so. He is the second player ever to have 1,127 strikeouts by his 5th season in the Major Leagues. He was only 29 strikeouts short of passing Tom Seaver for having the most strikeouts in the first five seasons as a Major League Baseball Player, which was 1,155. In 2011, Los Angeles Dodgers ace Clayton Kershaw and Lincecum matched up four times, evoking memories of the rivalry between Sandy Koufax and Juan Marichal in the 1960s. In those four games the scores were 2–1, 1–0, 2–1, 2–1, all in the Dodgers' favor. On September 10, 2011, they struck out a combined 20 batters. Lincecum finished the 2011 season 13–14, despite a top-tier ERA of 2.74 (4th in the NL) and a stellar second-half ERA of 2.31. Lincecum's win-loss record was largely due to his receiving the worst run support in all of Major League Baseball; the Giants scored no runs in ten of his outings and scored two runs or fewer in 21 of them, leading to Lincecum becoming one of only six pitchers in modern major league history to have at least 200 strikeouts, an ERA of below 2.75, and a losing record. Lincecum's knees started to get sore in 2011, and he felt he needed to lose weight. He spent the offseason swimming and gave up eating at In-N-Out Burger, losing 30 pounds (14 kg). Lincecum signed a two-year, $40.5 million deal with the Giants, making him eligible for free agency after the 2013 season. He rejected their offer of a five-year, $100 million extension. Lincecum was converted to a relief pitcher in the 2012 MLB playoffs. On October 7, Lincecum made a relief appearance during Game 2 of the 2012 National League Division Series (NLDS) against the Cincinnati Reds and threw two shutout innings. On October 10, in Game 4 of the NLDS, Lincecum made an important long relief appearance when his 4 1/3 innings helped the Giants beat the Cincinnati Reds to force a decisive Game 5 in their NLDS and Lincecum was named the winning pitcher. Counting his start against Atlanta in the 2010 playoffs and his two relief appearances in this series, Lincecum is 2–0 with an 0.59 ERA in NL Division Series play. He allowed just five hits and one walk while striking out 22 in 15 1/3 innings. Lincecum was second on The Giants in innings pitched during the NLDS, allowing just one earned run over 6.1 innings in two relief appearances and striking out eight batters without issuing a single walk. Lincecum won his second championship title in three years, pitching effective relief in the 2012 World Series 4-game sweep over the Detroit Tigers, in which he struck out eight of the 16 batters he faced, including the heart of the Tigers' order (Prince Fielder, Miguel Cabrera and Delmon Young). During the 2012 offseason, Lincecum "maintained an offseason conditioning program that he knew would help him coordinate the many moving parts in his delivery." After a series of lackluster performances in Spring training, many seemed to worry. He said, "Mechanically, I felt really good." He started the season 3rd in the rotation behind Cain and Bumgarner. On April 3, he made his first start of the season; he threw 5 innings, struck out 4, tied a career-high in walks with 7 batters, and allowed 2 runs (0 earned) on three hits while en route to the win. In his second start, there were signs of better control; despite walking 4 batters, he struck out 7 while allowing just 4 hits over 6 innings, eventually getting no decision. On July 13, 2013, Lincecum no-hit the San Diego Padres 9–0 at Petco Park, the first no-hitter ever pitched in that stadium and the first of his career. He struck out 13 batters, walked 4, and hit 1 while throwing a career-high 148 pitches, which were the second most number of pitches ever thrown in a no-hitter, after the 149 Edwin Jackson threw in his June 25, 2010 no-hitter. The 13 strikeouts were the second-most by a Giant in pitching a no-hitter, after the 14 in Matt Cain's perfect game a year earlier. Lincecum, the losing pitcher in Homer Bailey's second career no-hitter only eleven days earlier, became the first no-hit pitcher to also be the losing pitcher in another no-hitter during the same season since the Giants' Juan Marichal in 1963, as well as the first pitcher since Bill McCahan in 1947 to hurl a no-hitter after being on the losing end of the last no-hitter before it. The #FreakNoHitter hashtag became popular amongst social media. Lincecum finished the first half of his season with a record of 5–9 with a 4.26 ERA and 125 strikeouts, a significant improvement from his first half in 2012. On September 20 at Yankee Stadium, Lincecum struck out the New York Yankees' Curtis Granderson for his 1,500th career strikeout. He became one of just three pitchers to reach that milestone in their first seven seasons, joining Tom Seaver and Bert Blyleven. Manager Bruce Bochy pulled Lincecum when he loaded the bases with two outs in the bottom of the seventh inning, replacing him with George Kontos, former Yankee teammate of Alex Rodriguez. Lincecum had already retired Rodriguez three times, as Rodriguez was allowed to play for appealing his suspension for his involvement in the Biogenesis scandal. The runs were charged to Lincecum when Rodriguez hit his record-breaking 24th career grand slam. Despite an ERA of 4.54 in the second half of the season, it was considered inflated, as the bullpen accounted for an unusually high 12 earned runs charged to Lincecum. In 32 starts in 2013, Lincecum went 10–14 with 15 quality starts and a 4.37 ERA, striking out 193 in 197.2 innings. On October 22, Lincecum signed a two-year, $35 million contract through 2015, avoiding free agency. Lincecum would go on to earn $17 million in 2014 and $18 million in 2015. On June 25, 2014, Lincecum pitched his tenth career complete game and second career no-hitter, also against the San Diego Padres, this time at AT&T Park and on 35 fewer pitches. On the offensive side, he registered two hits, both leadoff singles, walked once, and scored two runs. This no-hitter was very nearly a perfect game, as the Padres had just one baserunner, Chase Headley on a second inning walk. It was his first no-hitter at AT&T, the second at AT&T against the Padres, and the third no-hitter in the short history of the ballpark. With his second no-hit performance against the Padres, Lincecum became the second player in Major League Baseball history to throw two no-hitters against the same team, joining Hall of Famer Addie Joss and the first in Major League history to do it in back-to-back seasons. He is also the second Giant with two no-hitters, along with Christy Mathewson. He has the most career no-hitters in San Francisco Giants history and is tied with Mathewson for most Giants no-hitters in franchise history. With his second no-hit performance, Lincecum joins elite company. He joins Sandy Koufax, Randy Johnson, and Roy Halladay as the only pitchers in MLB history to throw multiple no-hitters and win multiple Cy Young Awards as well as multiple All-Star selections. Lincecum and Sandy Koufax are the only pitchers in MLB history to throw multiple no-hitters and to win multiple Cy Young Awards and multiple World Series championship titles as well as multiple All-Star selections. For his play, on June 30, he was again awarded National League Player of the Week honors. On July 22, 2014, Lincecum earned his first career save, pitching 0.2 innings against the Philadelphia Phillies in a 9–6, 14-inning victory. In the 14th inning, he inherited runners at second base and third base with only one out. Only the runner at third scored. Lincecum became the fifth pitcher since 1976 to pitch a no-hitter and record a save in the same season, joining Matt Garza, Chris Bosio, Jerry Reuss, and John Candelaria. Saves became an official MLB statistic in 1969, but according to Baseball-Reference.com, it would make Lincecum the ninth Giants' pitcher to toss a no-hitter and record a save in the same season, joining Gaylord Perry, Carl Hubbell, Jesse Barnes, Rube Marquard, Jeff Tesreau, Hooks Wiltse, Christy Mathewson, and Amos Rusie. The last time Lincecum pitched out of the bullpen against the Phillies was in the 8th inning of the series-clinching Game 6 of the 2010 NLCS. On September 25, Lincecum won his 100th career game in a 9–8 victory over the San Diego Padres at AT&T Park, clinching a wild-card playoff berth. He became the first pitcher in Major League history to throw the least number of pitches and record the least number of outs to win his 100th career game at two and one. Lincecum entered Game Two of the 2014 World Series, opening the bottom of the seventh inning. He retired all five batters he faced, throwing 23 pitches, including 13 strikes and two strikeouts. Lincecum left the game in the eighth inning with lower back tightness. Despite the injury, the Giants defeated the Royals in seven games, to give Lincecum the third World Series championship of his career. Lincecum performed well during spring training in March 2015 and showed signs of his old form. Showcasing a newfound command in his repertoire, Lincecum improved to 2-2 with a 2.40 ERA with 20 strikeouts and 11 walks in 30 innings pitched by May 3. On the same date, he pitched eight scoreless innings against the Los Angeles Angels of Anaheim, striking out four and allowing only three hits and a walk. On May 8, Lincecum pitched six scoreless innings against the Miami Marlins, allowing only three hits and striking out eight. On May 20, in a 4-0 Win over the Los Angeles Dodgers, Lincecum pitched seven shutout innings and passed Hall of Famer Carl Hubbell for second place during the San Francisco era and fourth place in franchise history on the Giants all-time career strikeouts list. On May 20, 2016, Lincecum signed a one-year, $2.5 million contract with the Los Angeles Angels of Anaheim. He was optioned to the Triple-A Salt Lake Bees on May 22. 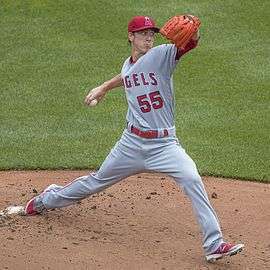 On June 18, after being called up to start in Oakland, Lincecum pitched six innings of one-run ball to earn a victory in his Angels debut. Lincecum can throw a four-seam fastball, but mostly uses a two-seam fastball grip which he throws generally around 87-89 mph for more sinking movement to get more ground balls. This pitch has little lateral movement, due to his overhand delivery and the speed at which the pitch is thrown. He has a breaking curveball that is thrown at a range of 72-75 mph and breaks away from a right-handed hitter. Lincecum uses a changeup that he grips similar to a splitter with sinking two-seam action. His changeup appears similar to his fastball for the first 30 feet (9.1 m), but then dives down sharply tailing away from a left-handed batter (80-83 mph). The majority of his strikeouts are recorded with this pitch. Lincecum also has a slider that breaks down and away from a right-handed hitter at 80-83 mph. Lincecum is known for his long stride, unorthodox mechanics, and ability to generate high velocity despite his slight build: originally listed as 5 ft 11 in (1.80 m) and 170 pounds. Lincecum was nicknamed "The Freak" by his Washington teammates because of his athletic abilities. His fastball velocity is down from his early years – it topped out at 99 mph in his first two MLB seasons but maxes out at low-90s mph now. After having hip surgery in September 2015 and 6 months of rigorous rehab, Lincecum's velocity was clocked at 92 mph (he topped 90 mph on his fastball due to hip injury in 2015). Lincecum's mother, Rebecca Asis, is the daughter of Filipino immigrants. Lincecum's father, Chris Lincecum, worked at Boeing and Tim held out for a large signing bonus so his father could retire. Chris was largely responsible for his son's interest in baseball at a young age, and taught Tim his unique and extravagant windup. He has lived in Sausalito, California and the Mission District/Potrero Hill area of San Francisco, steps away from the old Seals Stadium site, during baseball season. During the off season, he lives in Seattle, Washington. He has owned property in Paradise Valley, Arizona. He has a French bulldog named Cy. Lincecum has been described as the most beloved San Francisco sports figure "since Joe Montana", by the Sacramento Bee. Because of his "small size and unorthodox pitching delivery, he is an unlikely figure to have reached the pinnacle of his sport", which the Bee believes reflects the success of the Giants. Fox Sports calls him a "local legend and crowd favorite, now and forever." A 2010 This is SportsCenter commercial features Lincecum attempting to record a voicemail greeting on his phone, telling callers that they have reached "The Freak, The Franchise, The Freaky Franchise," and "Big Time Timmy Jim," but being dissatisfied with all. Finally, he decides to record one beginning simply "This is Tim Lincecum" – only to be interrupted by Karl Ravech walking by and saying "Hey, Big Time Timmy Jim!" A follow-up ad features Lincecum dunking the UMass mascot in the dunk tank. ↑ The Giants gave Angel Villalona a $2.1 million bonus a little over a month later. ↑ Lucchesi, Nick (July 9, 2008). "The List: ESPN's Baseball Player Name Pronunciation Guide". Blogs.riverfronttimes.com. Retrieved September 28, 2011. 1 2 "Player Bio: Tim Lincecum". GoHuskies.com. Retrieved May 13, 2008. ↑ "Tim Lincecum". MLB. Retrieved November 20, 2010. ↑ "USA Baseball Golden Spikes Award". USABaseball.com. Retrieved August 31, 2007. ↑ "PIL Player & NBC 2009 Graduate of the Year Earns 2nd Cy Young Award". Pacificinternationalleague.com. Archived from the original on July 16, 2011. Retrieved September 28, 2011. 1 2 3 Hohler, Bob (June 27, 2010). "Lincecum's Giants let their hair down". Boston.com. Retrieved July 19, 2013. ↑ "2003 First Year Player Draft Tracker, 48th round". mlb.com. Retrieved December 20, 2007. 1 2 Harvey, Coley (August 19, 2006). "Notes: Broken jaw sidelines Frandsen". MLB.com. Retrieved August 31, 2007. ↑ Cockcroft, Tristan H. (May 8, 2007). "Around the NL: Nolasco debuts, Rollins third". ESPN. Retrieved September 22, 2008. ↑ "2007 Top 100 Prospects". Baseball America. February 28, 2007. Retrieved August 31, 2007. ↑ "Tim Lincecum Statistics". The Baseball Cube. Retrieved May 13, 2008. ↑ Wilkins, Ryan (May 1, 2007). "Lincecum a Giant among prospects". PROTRADE. Retrieved August 31, 2007. ↑ Kline, Chris (May 3, 2007). "Ian Stewart on Tim Lincecum". Baseball America. Retrieved August 31, 2007. ↑ McCauley, Janie (May 7, 2007). "Howard Helps Power Phillies Past Giants". Washington Post. Retrieved September 22, 2008. ↑ Schulman, Henry (May 12, 2007). "Loose Lincecum registers first win". San Francisco Chronicle. Retrieved September 22, 2008. ↑ Nightengale, Bob (March 8, 2007). "Tim Lincecum: Looks can deceive". USA Today. Archived from the original on May 28, 2012. Retrieved September 22, 2008. ↑ Falkoff, Robert (April 19, 2008). "Cardinals shut down by Giants phenom". MLB.com. Retrieved September 22, 2008. ↑ Schulman, Henry (May 18, 2007). "Giants: Strong pitching by Lincecum, relievers helps beat Astros in 12 innings". San Francisco Chronicle. Retrieved August 31, 2007. ↑ "ESPN – Phillies vs. Giants – Play-by-Play – May 6, 2007". Retrieved July 15, 2008. ↑ "Tim Lincecum 2007 Pitching Splits". Baseball-Reference. Retrieved August 31, 2007. ↑ McCauley, Janie (July 1, 2007). "San Francisco 13, Arizona 0 (7/1/07 Recap)". Associated Press. Retrieved August 31, 2007. ↑ Haft, Chris (August 22, 2007). "Lincecum's gem dashed in ninth". MLB.com. Retrieved August 31, 2007. ↑ Regan, Becky (September 20, 2007). "Notes: Giants shut down Lincecum". MLB.com. Retrieved October 5, 2007. ↑ "Tim Lincecum Statistics (Minor Leagues)". Baseball-Reference: Minor Leagues. Retrieved October 5, 2007. ↑ "Tim Lincecum Statistics". Baseball-Reference. Retrieved June 12, 2008. ↑ Schulman, Henry (February 16, 2008). "In Lowry, Giants are looking out for No. 3". San Francisco Chronicle. p. D–1. Retrieved February 16, 2008. ↑ Gilbert, Steve (May 28, 2008). "Long ball hurts Haren in loss to Giants". MLB.com. Retrieved May 30, 2008. ↑ "NL | Giants' Lincecum not star struck, even after SI cover appearance". Seattle Times. July 4, 2008. Retrieved September 22, 2008. ↑ Baum, Bob (September 19, 2008). "RHP Tim Lincecum gets first loss since July". Seattle Times. Retrieved September 22, 2008. ↑ Baggarly, Andrew (September 13, 2008). "Giants' Lincecum throws four-hit shutout". San Jose Mercury News. Retrieved September 22, 2008. ↑ "2008 Major League Baseball Pitching Pitches". Baseball-Reference.com. Retrieved September 28, 2011. ↑ "2008 Major League Baseball Standard Pitching". Baseball-Reference.com. Retrieved September 28, 2011. ↑ "2008 Major League Baseball Batting Against". Baseball-Reference.com. Retrieved September 28, 2011. ↑ "2008 Major League Baseball Starting Pitching". Baseball-Reference.com. Retrieved September 28, 2011. ↑ Lincecum, Tim. "Tim Lincecum". Baseball Reference. Sports Reference LLC. Retrieved July 2, 2011. ↑ Haft, Chris (July 10, 2009). "Lincecum flirts with history, settles for win". MLB.com. Retrieved July 13, 2009. ↑ MLB.com (August 3, 2009). "Lincecum named National League Player of the Week". Sanfrancisco.giants.mlb.com. Retrieved February 22, 2012. ↑ "Boxscore: Colorado vs. San Francisco – September 14, 2009". Mlb.mlb.com. September 14, 2009. Retrieved September 28, 2011. ↑ Bahr, Chris (October 21, 2009). "Sporting News names Zack Greinke, Tim Lincecum AL, NL pitchers of the year". Sporting News. Retrieved October 24, 2009. ↑ "San Francisco Giants ace Tim Lincecum cited for marijuana possession". Sports.espn.go.com. November 6, 2009. Retrieved September 28, 2011. ↑ Haft, Chris (November 19, 2009). "Lincecum's the one; that makes two Cys". MLB.com. Retrieved November 11, 2009. ↑ "Colorado Rockies/San Francisco Giants Box Score". Yahoo! Sports. May 31, 2010. ↑ Anthony Stalter. "In regards to expanded playoff, Lincecum doesn't know where Selig's "head is at"". THe Scores Report. ↑ "Rockies' Jimenez is majors' first 10-game winner". Yahoo! Sports. ↑ "Giants' Tim Lincecum outpitches Roy Oswalt". mercurynews.com. Retrieved July 8, 2015. ↑ Schlueter, Roger (September 30, 2010). "Stat Speak: Lincecum, A-Rod join elite company". Retrieved November 12, 2010. ↑ "Tim Lincecum's sparkling debut carries Giants to 1–0 NLDS lead". ESPN. Associated Press. October 7, 2010. Retrieved April 22, 2012. ↑ Henry Schulman (October 17, 2010). "2 Jacks trump ace: Ross goes deep twice as S.F. tops Halliday". sfgate.com. Retrieved October 17, 2010. ↑ Manny Randhawa. "Tim Lincecum: The Most Important San Francisco Giant Ever?". The Bleacher Report. ↑ Rick Eymer. "Lincecum joins elite group with 1,000th". MLB.com. ↑ "Giants force decisive Game 5 with offense, relief". MLB.com. Retrieved October 12, 2012. 1 2 "Lincecum feels good in Spring Training debut". MLB.com. February 26, 2013. Retrieved April 5, 2013. ↑ "Tim Lincecum finishes spring training with 10.57 ERA". March 29, 2013. Retrieved April 5, 2013. ↑ "Depth Chart debut". April 5, 2013. Retrieved April 5, 2013. ↑ "Lincecum gets it done for 80th career win debut". April 3, 2013. Retrieved April 5, 2013. ↑ "Rox's big strike overcome by Giants' rally". April 9, 2013. Retrieved April 10, 2013. ↑ "Tim Lincecum tosses no-hitter as Giants beat Padres". USA Today. July 14, 2013. Retrieved July 25, 2013. ↑ "Tim Lincecum no-hits the Padres". CBS Sports. Retrieved July 14, 2013. ↑ "Tim Lincecum Records 1,500th Strikeout in New York". Around the Foghorn. Retrieved July 8, 2015. ↑ Sherman, Joel (October 23, 2013). "Why Giants don't think $35M for Lincecum is crazy". New York Post. ↑ Pavlovic, Alex (October 22, 2013). "Giants, Tim Lincecum agree on two-year, $35 million contract". San Jose Mercury News. 1 2 3 "Tim Lincecum throws second career no-hitter". CBS Sports. Retrieved June 25, 2014. ↑ Haft, Chris (July 22, 2014). "First career save gives Lincecum rare feat". MLB.com. Retrieved 2014-10-15. ↑ Hood, Ryan (September 26, 2014). "Light work gives Lincecum 100th career win". MLB.com. ↑ "Tim Lincecum leaves World Series Game 2 with lower back tightness". sbnation.com. October 22, 2014. Retrieved 2014-10-22. ↑ "San Francisco Giants' Tim Lincecum getting back on track for season and career". San Francisco Giants. Retrieved July 8, 2015. ↑ "Tim Lincecum Pitching Statistics and History – Baseball-Reference.com". Baseball-Reference.com. Retrieved July 8, 2015. ↑ "Tim Lincecum, early homers lead Giants to sweep of Angels". San Francisco Giants. Retrieved July 8, 2015. ↑ "Tim Lincecum's pitching, Casey McGehee's grand slam help Giants beat Marlins". San Francisco Giants. Retrieved July 8, 2015. ↑ "Extra Baggs: Amid Karl the Fog, Lincecum passes Carl Hubbell; Buster Posey deals with taunting Dodgers; a get-right inning for Jeremy Affeldt, etc.". Giants Extra. Retrieved July 8, 2015. ↑ "Lincecum officially signs $2.5M deal with Angels". Sportsnet. May 20, 2016. Retrieved May 20, 2016. ↑ "2013 Box Scores and Play by Play – Baseball-Reference.com". Baseball-Reference.com. Retrieved July 8, 2015. ↑ "2014 Box Scores and Play by Play". Baseball-Reference.com. Retrieved July 8, 2015. 1 2 3 4 "Tim Lincecum » PitchFx » Overview". FanGraphs. Retrieved Jun 23, 2016. ↑ Josh Kalk (November 18, 2008). "Another look at Tim Lincecum". The Hardball Times. Retrieved April 9, 2007. ↑ "Tim Lincecum Stats, Bio, Photos, Highlights". MLB. Retrieved October 7, 2010. ↑ Kepner, Tyler (November 2, 2010). "A new ace for a new era". The New York Times. Retrieved January 17, 2015. ↑ Ott, Tim (December 19, 2008). "Season's finest claim TYIB Awards". MLB. Retrieved January 3, 2009. ↑ Stone, Larry (October 21, 2008). "Former Husky Tim Lincecum captures two NL honors". Sporting News. Retrieved October 23, 2008. ↑ Schulman, Henry (October 21, 2008). "Lincecum earns players' vote". San Francisco Chronicle. Retrieved October 23, 2008. ↑ "2K Sports Signs National League Cy Young Award Winner Tim Lincecum of San Francisco Giants as Cover Athlete for Major League Baseball". 2K Sports. November 11, 2008. Retrieved July 19, 2013. ↑ "Lincecum Named National Freshman Of The Year". Go Huskies. June 15, 2004. ↑ "Lincecum Named Pac-10 Pitcher & Freshman Of The Year". Go Huskies. June 3, 2004. ↑ "Lincecum Named Pac-10 Pitcher Of The Week". Go Huskies. April 19, 2005. ↑ "Prep notebook: Lincecum, Curtis share MVP award". Seattle Times. July 12, 2003. Retrieved November 15, 2008. ↑ Bryan Kilpatrick. "Meet Addie Joss, the other pitcher to throw 2 no-hitters against the same team". SBNation.com. Vox Media. Retrieved July 8, 2015. ↑ "Top stats to know: Lincecum's 2nd no-hitter". ESPN.com. Retrieved July 8, 2015. ↑ "No-hitter notes: Lincecum joins Koufax in exclusive club". CSN Bay Area. Retrieved July 8, 2015. ↑ vergaso, Jun (November 16, 2008). "Fil-Am major league pitcher wins baseball's top award". The Manila Times. Archived from the original on October 2, 2011. Retrieved November 2, 2010. 'As far as the diversity of the city goes, it's up there,' said Lincecum, whose mother Rebecca Asis is the daughter of Filipino immigrants. Schuman, Henry (April 22, 2009). "Grand night for Renteria". San Francisco Chronicle. p. D–1. Retrieved November 2, 2010. Before the game, the great Filipino fighter Manny Pacquiao threw the ceremonial first pitch to Tim Lincecum, whose mother is Filipina. ↑ "Inside Tim Lincecum's Old Party Pad (Pre-Alleged Trashing)". Retrieved July 24, 2016. ↑ Schulman, Henry. "Tim Lincecum, ex-landlord settle suit". Retrieved July 24, 2016. ↑ Riggs, Erika. "Tim Lincecum Selling 'Fifty Shades of Grey' Condo". Zillow. Yahoo!. Retrieved November 1, 2014. ↑ Heffter, Emily. "Giants' Tim Lincecum lists giant Arizona mansion". Today. NBC. Retrieved November 1, 2014. ↑ Riley, Daniel. "Super-Freak". GQ. Condé Nast. Retrieved November 1, 2014. ↑ Breton, Marcos (October 24, 2014). "Opinion: San Francisco Giants fans leave their hearts high on a hill with Tim Lincecum". News Columns & Blogs. McClatchy Company. Sacramento Bee. Retrieved November 1, 2014. ↑ Goot, Alex. "Tim Lincecum, Man and Myth". FOX Sports Live. FOX. Retrieved November 1, 2014. ↑ Hoppes, Lynn (July 3, 2012). "This is SportsCenter: Tim Lincecum". Playbook blog. espn.go.com. Retrieved 2014-10-15.